Posted June 2nd, 2014 by admin & filed under Blog, Reviews. 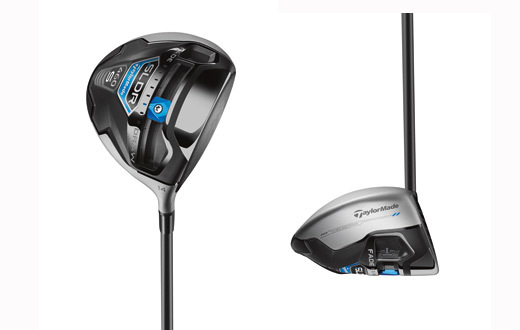 TaylorMade are the company who made white heads and adjustability universally accepted in drivers. Now they are challenging another piece of golfing heresy – namely that a driver cannot have 16° of loft. TaylorMade believe that some golfers will benefit from the higher launch angle that a 16° driver can provide, allied with the low-spinning flight that has become the SLDR’s trademark. The new SLDR S driver is part of a new family that promises to offer the benefits of SLDR performance with the additional forgiveness and playability that most of us need. So far the SLDR family has concentrated on the better player – tour professionals and skilled amateurs. Now there is an SLDR for all of us. The first thing you will notice about all the clubs in this family are the silver-satin crowns, finished off by what TaylorMade are calling a ‘black button-back’. The driver promises to launch the ball higher than a regular SLDR but with the same low spin – this is the combination that TaylorMade believe is the secret to optimum driving performance. “The low-forward centre of gravity promotes high launch, fast ball speed and low spin for exceptional distance,” say the equipment giants. As well as a 16° version, the SLDR S driver is also available in 10, 12 and 14° models. The fairway woods start at 15° and go up to 23° while the hybrids run from 19° to 28°. The price point of the SLDR S family is noticeably lower than that of the initial super-premium SLDR range. The launch follows other new additions to the SLDR family including the SLDR mini driver and SLDR white driver and SLDR Irons. The Golfers Club is offering one lucky member the chance to win an SLDR S Driver, SRP £279. The SLDR S Driver is available in which versions? To enter, email your answer to competitions@twww.golfcare.co.uk with your name, membership number and contact number. The prize draw will take place on 30.06.14.